Step 3: We did it! A magician never reveals his secrets, but I'll make an exception this one time. Since a Card is attached to the window it was spawned from, users can click outside of the "Card on Card" window and effectively hide it from view (including the Dialog Window). 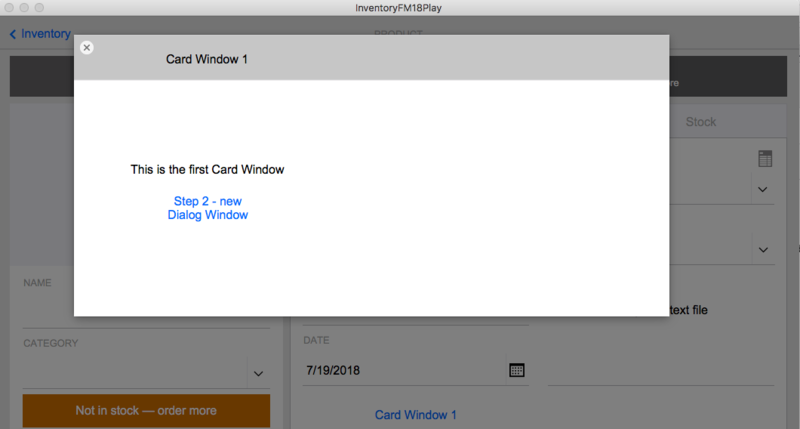 As a best practice, when opening a subsequent Card Window, check to see if the Card Window is already open and if it is, select it. If a window isn't already open, go ahead and create it. Or as long as the starting window is not maximized, you could place the subsequent Dialog and Card Windows outside of the starting Windows so that the user can see both, regardless of which one is active. If you use this method, the Cards will not appear to be stacked so keep that in mind if you want to maintain the semblance of an ordered process. Imagine you want users to enter data in a Card Window one row at a time, such as when adding data to child records. They would start with a single field/row of fields and they can request to display a new row as they go. You can create this experience by first adding all of the fields/rows on a slide panel and then scaling the slide as large as needed to hold all of the records. Next, move the bottom of the slide panel up to hide all fields or maybe only display the first row by default and anchor the bottom of the slide panel. 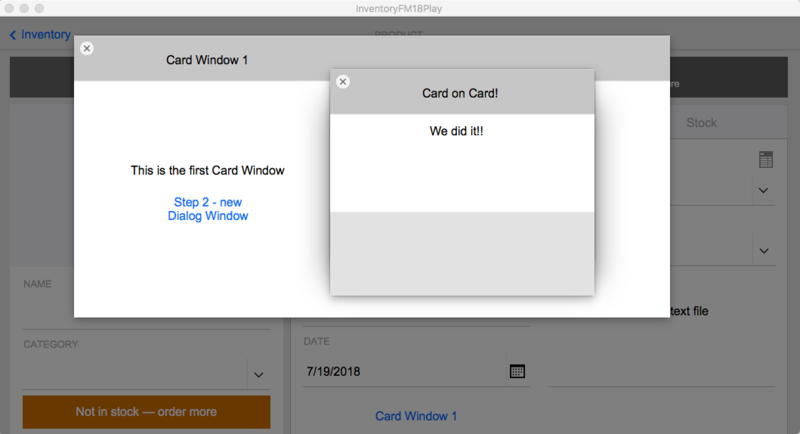 Be sure to create an "Add Row" button, which will simply resize the height of the Card window to display the additional row. Basically, instead of actually adding a row, all you're doing is resizing the window. Pretty cool trick, huh? You can take this process further and store the data in global fields until the user completes the data entry. At that point, the data can be transferred and committed to the appropriate records. This will help to preserve the integrity of the database. 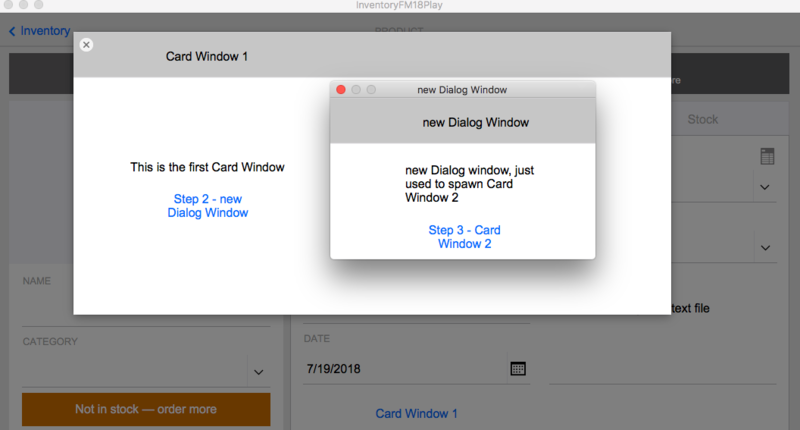 Did you know that you can create a separate database just for Card Windows? This is is a powerful concept that is generally used for adding functionality like what you can get from ModularFM. Then you will have a resource of functionality that can be shared between multiple solutions or very easily added to new solutions. Don't forget that Card Windows do not work with WedDirect or server-side programming, neither scheduled scripts nor Perform Script on Server. I hope you found my recap helpful. Check out the session materials in the FileMaker Community for more details. And, we have more FileMaker tips and tricks to share. Join our mailing list to keep up with the latest news and information about FileMaker and other custom app development tools. This article is also posted on FileMakerProGurus.com.